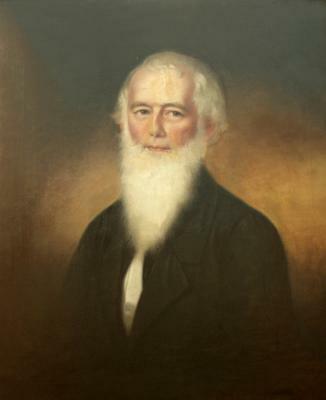 Portrait of Edward William Johnston by Sarah Miriam Peale (circa 1858-1860). Original at University of Missouri - St. Louis / Mercantile Library. 'The catalogue [for the St. Louis Mercantile Library] was really a noteworthy work in the field. There were supplementary bibliographical notes interspersed that revealed the scholarly qualities of Johnston and showed him as well qualified for the position of librarian, to which post he was elected in April, 1859. At last it seemed he might have reached the harbor of serenity. For two years he carried on the multiple and often incongruous activities of a librarian in an understaffed library: buying books, classifying and cataloguing them, supervising the reading of the membership at the issue-desk, providing reference material for the studious, serving everybody in one way or another and happy in the task' (pages 84-85). 'In my early days at the library I talked to many who remembered Johnston at this period. They all remembered him distinctly and intimately, as ordinary men who have been dead nearly forty years are not recalled. To them he was a brilliant, warm and eager personality, a man rich in shrewd and humorous comment on the celebrities of his day, all of whom he seemed to have known. A communicative and friendly man, but nevertheless something of an enigma . . .' (page 85). 'The opening of 1862 found poor Johnston at the very center of civil strife. A struggle between the Northern and Southern members of the library for control of the board of direction focused the attention of the military authorities on the library, and so on January 26 General Henry W. Halleck issues [issued] Special Order No. 80, requiring the board members and employees of the library to take the oath of allegiance at noon on January 29. . . on January 28 he [Johnston] submitted his resignation to the directors, explaining that he was engaged in the composition of an historical work that would occupy his entire time. A few weeks later we find him employed in cataloguing the library's recently acquired coin collection. For this work he was paid $400' (page 85). 'On August 18, 1862, Johnston's wife was arrested at Eureka, Missouri, for voicing Southern sentiments. She was brought to Gratiot Street Prison, in St. Louis, but was released the next day. She died sometime within the next few years, a shadowy lady about whom I should like to know more' (page 85). 'Johnston, now a lonely, emaciated old gentleman, returned to St. Louis and taught for a while at the Academy of the Christian Brothers. He joined the Catholic Church, and married his housekeeper, probably in 1866. In the spring of 1867 he became very ill with cancer of the throat, and on December 9, 1867, after protracted agony, he died. His second wife, Margaret, who was tubercular, survived him but a few hours, and both were buried in Calvary Cemetery on December 11, 1867. General Joseph E. Johnston was the only member of the family mentioned as being in attendance, and he arrived in the city too late to see his brother alive. Johnston's literary papers were willed to another brother, according to the obituary in the St. Louis Times, but no will was recorded . . .' (pages 85-86). 'The long white beard is in startling and patriarchal contrast to the comparatively youthful face. Miss Peale evidently lapsed into a spinster's panic when she sighted it, merely draping it on like a stage property or ceremonial appendage. As a symbol of the strange and hearltess pranks life can play on man it might pass, but as a growth from flesh and blood it is quite incredible' (page 87). 'How inadequately the incidents in a man's life reveal his character and motives. I wonder what manner of man that Edward William Johnston really was . . .' (page 85). Clarence E. Miller (1881-1964) was librarian at the St. Louis Mercantile Library from 1941 to 1958; he worked at the library for more than fifty years. The Academy of the Christian Brothers was a college level Catholic school located in St. Louis. It is now, in a different location, the Christian Brothers College High School. "His second wife Margaret" was the same wife who was sent to Gratiot Street Prison, not a different person. She also had a daughter from a previous marriage, Margaret Jewett, who lived with them until their near-simultaneous deaths. Sarah Miriam Peale (1800-1885) also did portrait paintings of the Marquis de Lafayette (1757-1834).